The subject of Daskalos’ talk was elementals. At first he summarized many of the ideas he had discussed during previous meetings. It was his pedagogic method to repeat old material on a routine basis until his students had fully digested it. Our present personalities, Daskalos went on, and the circumstances within which we live, are the sum total of the elementals we have constructed ever since our descent into the three-dimensional world and the beginning of our cycles of incarnation. Elementals are built with the very substance with which personality and the universes in general are built, that is, with etheric matter of the noetic, psychic, and gross material worlds. Therefore the builder of an elemental will have to sooner or later confront the elementals that he himself has construeted. You may wonder whether we can today avoid the influenece of former conditions. Yes, assuming that we employ equal power with that of the elementals that we have constructed. When we advance spiritually we become conscious of our responsibility for the fall of our fellow man as a result of elementals left over by us in the etheric world. Do you understand now why Christ said, “Do not judge lest you be judged”? Because you shall be judged by your own inner self. You created these elementals regardless of whether you have transcended the condition that led you to the creation of them. I urge you not to be concerned about how others judge or think of you. Fear only the judgment of your own inner self. Someone asked me once whether I was afraid of God. I said no, I love God and I try to be worthy of His love. What about, he said, the people around you? No, I said, I don’t judge them and I don’t care about their opinions of me. Aren’t you afraid of anything? I am afraid of myself because I cannot deceive myself. When I sit down to meditate and practice my analysis, my inner self will ask, “What did you say? What did you do? What should you have done and you failed to do?” When we begin to listen to our inner self we are on the right path. We will no longer create evil elementals which will be floating in the etheric spheres and tormenting those around us. The Researcher of Truth must reach a point where he does not create elementals of desires-thoughts but, rather, elementals consciously constructed that are under his full control. When they leave him he will be able to govern and guide them regardless of how far away they may bee Such elementals of thoughts-desires are more concrete, more effective, and of a greater duration. For this reason we are more responsible for them. The person of benevolent thoughts must be certain that what he constructs receive the blessings of the higher spheres. “Do I have to sacrifice my personality? It’s painful but I like it.” You are going to lose nothing, because every incarnation with the virtues and the vices, with the good actions and the wickedness, that total collection of the elementals, is living, is a living form. Behind you, in all your past lives, nothing is lost. There is a living total of all your experiences (elementals) in the Cosmic Memory. And when you reach that state of “Be ye perfect as perfect is your Heavenly Father,” you will see that in every incarnation you have written, say, a book. You have it in the Cosmic Memory like in a library on its shelves. You are like a writer who is writing books. Who is preventing you to get a volume and go through it again? And reading it, you can enjoy what is enjoyable and what is painful, by the grace of God now, it will not affect you any more, because – you have got rid of those vices. So, when you reach perfection, you are not going to lose anything. You are not going to lose your Present-Day Personality that is so precious to you now. You will find, inside you, all the volumes you have written in all your past incarnations. In perfection you are gaining, not losing. You are gaining, because, nothing made of the Mind vitality, no thoughts, no emotions, no desires are lost. When you reach the attunement, you can attune yourself to any one of your incarnations. Can we, by at-one-ment, enter into that living total elemental of our past personality? If you wish to, you can. But, why would you? Is not the attunement seeing and knowing? Anyhow, it’s nothing that I wish to do myself. Attunement is worthwhile with Joshua Emmanuel the Christ and with God and not with past elementals. 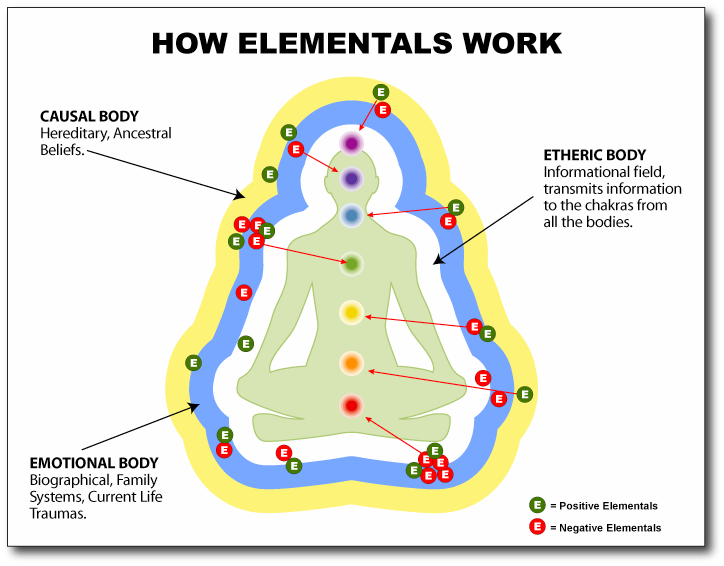 We can identify various types of elementals. Some spring from inside the personality, others are drawn from the out side environment. We either create elementals with our desire-emotions and thought-emotions; or our personality vibrates at a frequency common to a collection of elementals of a like kind and then attracts these elementals. The latter are the so-called “group elementals” that have been cultivated over the centuries by the perpetuation of common beliefs and actions. They can be either benign or malicious in intent. Our personality, whether weak and ill-natured or strong and compassionate, will activate these group elemen­tals. Once activated they will cling to the host personali ty, affecting emotions, thoughts and actions. The majority of the elementals we house are intelligent and demanding. They can force the personality to act in a cer tain manner which creates the conditions for the elemental to be satisfied and renewed. If we are filled with elementals of greed, envy and hatred, these elementals will dic­tate to our personality actions and behaviors that will lead to great disagreements and brawls, not to mention hellish inner dissatisfaction. If we are compassionate and peaceful in nature, our elementals will lead us into situa tions where we can be of some help and service. On the other hand, someone who is laboring under a particular guilt, can temporarily be helped by an angelic being or through the meditation of other humans who pray for him, or by the expression of Divine Mercy.Prayer is the process of shaping and emitting loving elementals. Let us not cast blame on our surroundings. There are many elementals around us. There are elementals, for example, of those we call alcoholics, many of whom try to present themselves as victims of society. Such people are respon sible for their sorry state, since they have created or drawn to themselves very strong elementals, which take great will power to dis-energize. Yet the same elementals surround us all. I have a text Chakana – The Incan Cross which looks at these elementals in Incan and other traditions. Agree Tom. I have four people who I see as initiates, Beinsa Douno/Peter Deunov, Rudolf Steiner, Franz Hartmann and Daskalos, and Edgar Cayce may very well be also, although his approach was a little different, but contained valuable results. Yes, John the Baptist is the spiritual leader of the white brotherhood, with the twelve Bodhisattvas or Sages around him in the center. The Baptist were also Elijah and in that incarnation he gave the Mantle to Elisha, and Elisha is later reborn as John the gospel writer, who should await the return of Christ, and he is also known Christian Rosenkreuz. My favorite books are about the Magus of Stovolos. Wonderful books.